A wonderful time was had by all at our 2015 Christmas Social and mini tradeshow, and such a great way to finish up another year! Merry Christmas ladies and I look forward to connecting, sharing and learning with all of you in 2016! Looking forward to seeing everyone on Thursday. 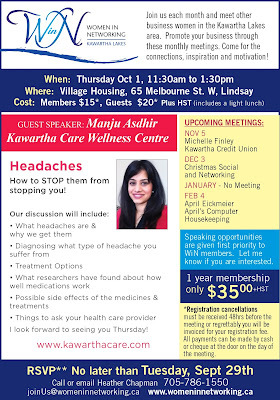 Manju Asdhir of Kawartha Care and Wellness will be our guest speaker. Please see full details below. I hope you have all had a wonderful summer, it’s so hard to believe that we’re heading into September! Thursday, September 3rd is our next WiN Meeting. Marlene Luscombe will be presenting on the topic of Urban Polling. Full details below. 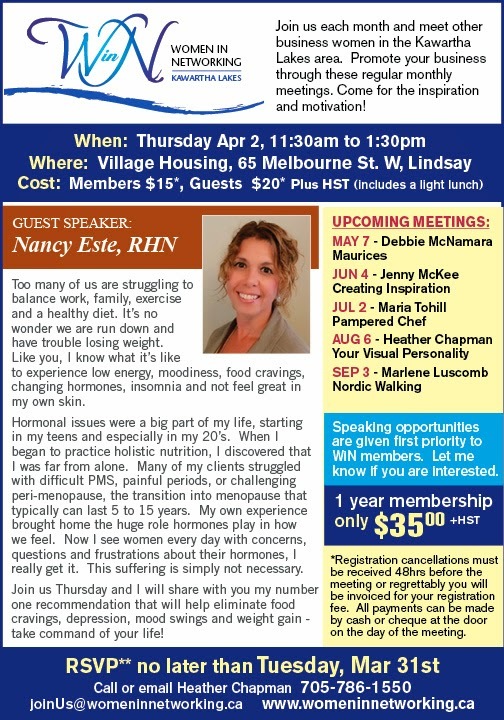 Please let me know as soon as possible (by emailing heatherchapman@sympatico.ca) if you are planning to attend. A quick reminder that our August WiN meeting is scheduled for Thursday, August 6th. I will be your guest speaker. 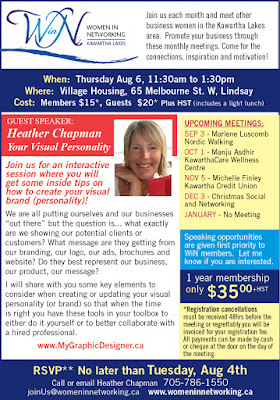 Join us for an interactive session where I will share some key tips on creating your “Visual Brand". Full details below. 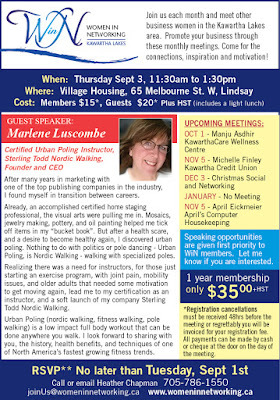 Please let me know as soon as possible if you are planning to attend by emailing me at info@womeinnetworking.ca. I look forward to seeing everyone and please share with anyone you think may be interested in attending. A quick reminder that our July WiN meeting is Thursday, July 2nd. Maria Tohill, our lovely Pampered Chef will be speaking and Edna will be preparing us a wonderful lunch using Pampered Chef recipes (last year it was so yummy!). There will be an opportunity to place an order if you would like and all proceeds will go towards the Food Source in Lindsay. Save the date! Our next WiN meeting is scheduled for Thursday March 5th. Our guest speaker will be Karen Kearney of Project Home. Full details to be posted soon. I look forward to seeing everyone in March! Our February WiN meeting will take place on Thursday, Feb 5th. 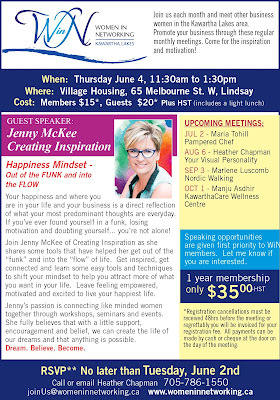 Our guest speaker will be Glenda van Koot, full details below. Please let me know via email if you plan to attend.